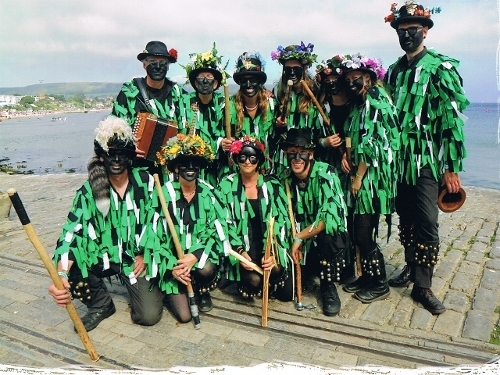 Founded on 5 June 2008, Borderline is a Fun-loving, Mixed Morris Side, based in Barnstaple, North Devon. We are Members of theMorris Federation. We perform Traditional and Other dances in the boisterous 'Border' style, which comes from the English "Border Counties". We wear raggy jackets in the Devon colours of green, black and white and disguise our faces to go begging! We meet on THURSDAY evenings when we practice during the Winter and dance at local venues in Summer. At weekends we perform at Festivals and other events. Or, perhaps you're looking for our twin from Berkshire.